Henderson City Hall is located at 222 First Street, Henderson, KY 42420; phone: 270-831-1200. Photo: Barret House, ca. 1868, 204 South Elm Street, Henderson, KY. Listed on the National Register of Historic Places in 1978. Photographed by User:Nyttend (own work), 2012, [cc0-by-1.0 (creativecommons.org/publicdomain/zero/1.0/deed.en], via Wikimedia Commons, accessed October, 2015. Henderson, seat of Henderson County, is on the high red bluffs facing the mile-wide Ohio River. Many well-kept country estates and spacious old homes are on the wooded hills. The town was founded by the Transylvania Company (later known as the Richard Henderson Company) in the year 1797, on 200,000 acres granted to the company by the State. The first settlement, made in and around the old stockaded village of Red Banks, was named for Colonel Richard Henderson, leader of the company. On the original plat of the town, which is in the courthouse, all the streets were 100 feet wide, and the entire river front two and a quarter miles long was municipal property. Today these wide thoroughfares and this river front, which is being made into a continuous park, are among Henderson's most attractive features. On a hill in Transylvania Park, which divides the town, is the Henderson County Courthouse, a two-story building of stuccoed brick, completed in 1842. A pedimented Greek Revival portico with four Doric columns and an octagonal cupola relieve its austerity. Six large tablets in the courthouse record the exploits and achievements of the Transylvania Company from the time it sent Boone to cut a trail into the wilderness to the founding of Henderson. John James Audubon, the ornithologist, whose home was here from 1810 to 1819, lived in a little log house near the corner of Main and 2nd Streets. On the same corner was his general merchandise store and near by his frog and turtle pond. Second Street was formerly known as the Old Mill Road, being the route used from the country to Audubon's mill. The Lockett House, at the corner of Elm and Jefferson Streets, is a one-story frame dwelling on a brick foundation. It was built in 1856 for Judge Paschal Hickman Lockett, nephew of Capt. Paschal Hickman, one of the heroes of the Battle of the River Raisin during the War of 1812. 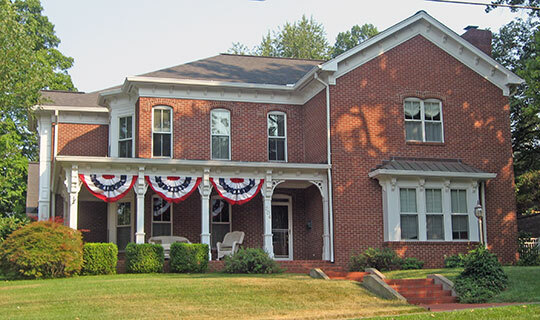 In the sitting room of this house is the first coal-oil lamp used in Henderson County. It was brought from New Orleans by Judge Lockett in 1856. In 1862, when the news came to Judge Lockett that the Federal soldiers had crossed the Ohio, and, under the command of Captain Shanklin of Evansville, Indiana, were stationed in the woods near his home, he had the slaves remove part of the cellar wall and dig a trench in which he hid valuables as well as the contents of the smokehouse and other provender. The massive front door still shows the scars made by the gun butts of soldiers who were attempting to gain entrance, when Captain Shanklin, having just learned that Mrs. Lockett was his former sweetheart, restrained them. The Lazarus Powell House, 216 South Elm Street, was built in 1818 by the father of Lazarus W. Powell, United States Senator and later Governor of Kentucky (1851-55). The older part of the two-story frame structure, designed in the Georgian style, has two huge square rooms on each floor that flank wide central halls. The stairway, simply constructed of beautiful hardwood, is satin-smooth through long usage. The side lights beside the paneled doors are of old glass. These doors have hand-wrought butterfly hinges and two of them have the original locks bearing the arms of William IV of England. In 1857 two rooms of brick were added, one for a private study and one for a bedroom. The slave quarters are still in the back yard. The P. J. Lambert House, South Main Street, built about 1830, has wrought-iron balustrades and balcony, and red-brick steps. St. Paul's Episcopal Church, corner of Center and Green Streets, of English Gothic design, is a copy of the famous old church at Stoke Poges, England. The three stained-glass windows of the chancel, portraying scenes from the life of St. Paul, were made in Holland. There are also several memorial windows and a tablet dedicated to Bishop Channing Moore Williams, a native of Henderson, who built the first Protestant church in Japan and with the Reverend John Liggins was the first Protestant missionary in Japan.